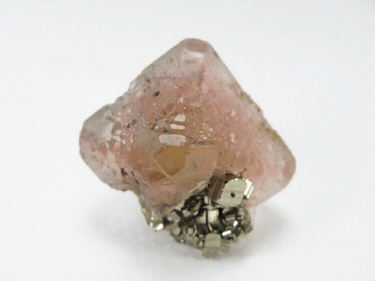 A very gemmy pink fluorite crystal from a find made about 2 years back, with a clear pink phantom. Unlike most others pink fluorites from the mine, these have not been lacquered or oiled. Many specimens from Huanggang (even quartz) typically have altered rinds or acid eaten surfaces that require oiling to be appreciated-- these were somehow spared that harsh treatment and are quite displayable without any enhancements. Please note that the color of these fluorites varies with lighting. The color is strongest under a full spectrum lightbulb, a bit weaker under fluorescent or tungsten bulbs, and a bit weaker still in sunlight.